This frozen and healthy sweet treat is a perfect breakfast, snack or dessert! Your tummy and taste buds will thank you for this one. 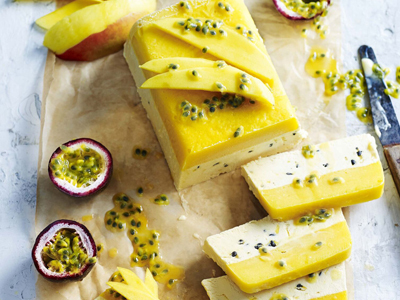 From EAT WELL, LIVE WELL, enjoy the Mango, Coconut & Passion Fruit Parfait recipe. YOU WILL NEED TO MAKE THIS RECIPE A DAY AHEAD. 1. Grease a 4 x 8–inch loaf pan; line base and two long sides with parchment paper, extending the paper 2 inches over the sides. 2. Blend or process chopped mango until smooth; pour into loaf pan. Freeze for 2 hours or until firm. 3. Stir together pulp from 4 passion fruit, the sugar, and the water in a small saucepan over low heat until sugar dissolves; bring to a boil. Reduce heat; simmer, uncovered, for 5 minutes or until syrup is reduced by half. 4. Beat egg yolks in a small bowl with an electric mixer until pale and creamy. With motor operating, gradually add hot passion fruit syrup. Continue beating for 3 minutes or until mixture has cooled. Fold in coconut cream and crème fraîche. Pour passion fruit mixture into loaf pan. Cover; freeze overnight or until firm. 5. To serve, invert parfait onto a platter. Top with mango slices and pulp from the remaining 3 passion fruit. Make Ahead: Parfait can be made a week ahead. 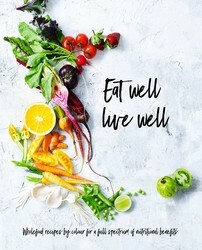 Help you gut with these reads.